Indium Corporation was presented with the Global Technology Award for Solder Paste for Indium10.1HF Solder Paste at SMTA International (SMTAI) Conference in Rosemont, Ill.
Indium10.1HF Solder Paste is a halogen-free, no-clean formula that delivers ultra-low voiding in bottom terminated components (BTCs). The flux is specifically engineered to improve reliability by minimizing voiding while also providing excellent wetting, lower solder beading, and reduced solder balling to meet IPC specifications. Indium10.1HF also minimizes slumping and resists head-in-pillow defects. Indium10.1HF is perfectly suited for a variety of applications, especially automotive, due to its unique oxidation barrier technology. This solder paste has robust reflow capability and a wide process window, accommodating various board sizes, component sizes, and throughput requirements. 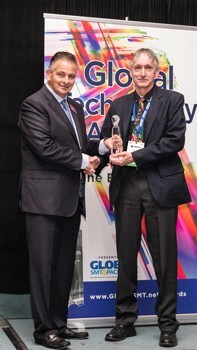 Sponsored by Global SMT & Packaging, the Global Technology Awards have acknowledged outstanding innovations in the printed circuit board assembly and packaging industry for more than 10 years.